Teething is the normal process in which your baby's first set of teeth (primary teeth) break through the gums (erupt). Teething usually begins at around 6 months of age, but it is different for each child. Some children begin teething at 3 to 4 months, while others do not start until age 12 months or later. 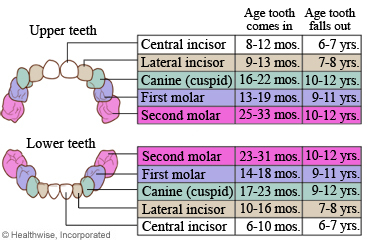 A total of 20 teeth erupt by the time a child is about 3 years old. Usually teeth appear first in the front of the mouth. Lower teeth usually erupt 1 to 2 months earlier than their matching upper teeth. Girls' teeth often erupt sooner than boys' teeth. Your child may be irritable and uncomfortable from the swelling and tenderness at the site of the erupting tooth. These symptoms usually begin about 3 to 5 days before a tooth erupts and then go away as soon as it breaks the skin. Your child may bite on fingers or toys to help relieve the pressure in the gums. He or she may refuse to eat and drink because of mouth soreness. Children sometimes drool more during this time. The drool may cause a rash on the chin, face, or chest. Teething may cause a mild increase in your child's temperature. But if the temperature is higher than 38°C (100.4°F), look for symptoms that may be related to an infection or illness. You might be able to ease your child's pain by rubbing the gums and giving your child safe objects to chew on. Give acetaminophen (Tylenol) or ibuprofen (Advil, Motrin) for pain or fussiness. Read and follow all instructions on the label. Gently rub your child's gum where the tooth is erupting for about 2 minutes at a time. Make sure your finger is clean, or use a clean teething ring. Do not use teething gels. Some teething gels contain the medicine benzocaine, which can harm your child. Talk to your child's doctor about other teething remedies. Give your child safe objects to chew on, such as teething rings. Do not use fluid-filled teethers. If your child is eating solids, try offering cold foods and fluids, which help to ease gum pain. You can also dip a clean face cloth in water, freeze it, and let your child chew on it. Your child keeps pulling on his or her ears. Your child has diarrhea or a severe diaper rash. You think your child has tooth decay. Your child is 18 months old and has not had an erupting tooth yet. Enter C015 in the search box to learn more about "Teething in Children: Care Instructions".